In this article I'll describe how we calculate each of these, and why they are so valuable to us as vacation rental owners. This is how many bookings you take on average for each inquiry. Or to put it another way, the number of inquiries to which you typically must respond before one of them results in a booking. If you keep a record of every inquiry and every booking, then it's very easy to calculate an aggregate number. In our case this figure is currently 11%. So, on average, we get one booking for every 9 inquiries that we receive. But beyond generating this single figure for yourself, it can be a useful way of comparing your performance year over year. For example, over 2009 our bookings per inquiry rate was just 8%. So this tells us that in 2009, we had to field an average of 12 inquiries before we were able to convert one of them into a booking, while currently it just takes 9 inquiries before we book. Beyond tracking your performance year over year, this can also be a helpful way to remind yourself what is "normal" during off-season months, when it seems to have been an age since your last booking. As each inquiry comes in we try to determine where it came from. In other words, you want to know which your advertising efforts are working. For example, sources you might record might include: the name of the VR listing site where the guest found you listed, referral through one of your previous guests, or your own web site or blog. 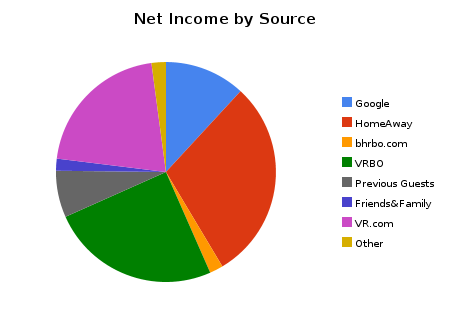 Using this data, we can generate a pie chart showing how much net income we have generated through each source. From the article Should you renew your VRBO listing? We track this report year over year to determine the effectiveness of each of the listing sites we pay for advertising space. It also reveals how well we are converting previous guests into repeat customers. Every vacation rental will have a high season and low season - whether you're on the beach or near a ski resort or a world-renown city. Any location will have a typical pattern to when vacationers start inquiring about lodging for its different seasons. For example, a destination to where visitors will typically fly rather than drive will probably begin getting booked up sooner than a vacation destination which can be reached by car. Charting how many inquiries you receive each month will help you begin to see these trends for your specific location. If you know from your data that you are approaching a slow month during which you expect to receive very few inquiries, and yet you still have an important week open, that may be your cue to start advertising a discount. Perhaps the number of inquiries in a day is not the most valuable report of this set of 5, but we still find it interesting to see what times of the week most people inquire about a vacation. In our own experience, we have noticed that Fridays and Saturdays are relatively quiet days. The number of calls and emails starts to pickup on Sunday; but it's really Tuesday when it peaks. We have hypothesized that people tend to talk about vacation plans over the weekend, return to work on Monday and are too busy to think about it. But by Tuesday, they're daydreaming of where they would rather be, and start shopping for reservations. The most sophisticated report that we generate, Inquiries That Booked by Month, is a table showing the months of the year across the top and down the left. The months down the left represent when we received an inquiry that resulted in a booking. The months across the top represent the month of check-in for that booking. So, for example, this chart allows us to see when the guests who have stayed at our vacation rental in August typically reserved their dates. Together with the Inquiries by Month chart, this report is a valuable aid in deciding whether we are too close for comfort to an unbooked week, and how aggressive any discounts we offer should be. When we can identify any times of year when nights typically book last minute, we can avoid charging unnecessarily low rates simply because inquiries come in later than we're used to. 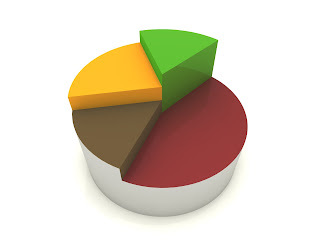 These are just a small fraction of the reports and statistics that you can generate if you consistently record some basic information about each and every one of your inquiries and bookings. We use this spreadsheet for a lot of other purposes too. The notes you save on your conversations with potential guests (even those who do not book with you) can be mined later for ways to personalize any future marketing communications you write, or even to help you decide what improvements to make to your property or amenities to add. Altogether, the records we keep of all our inquiries are arguably the most important data that we have for running and improving our business. If you generate other metrics that you find helpful in managing your own vacation renal, please mention them below in the comments.